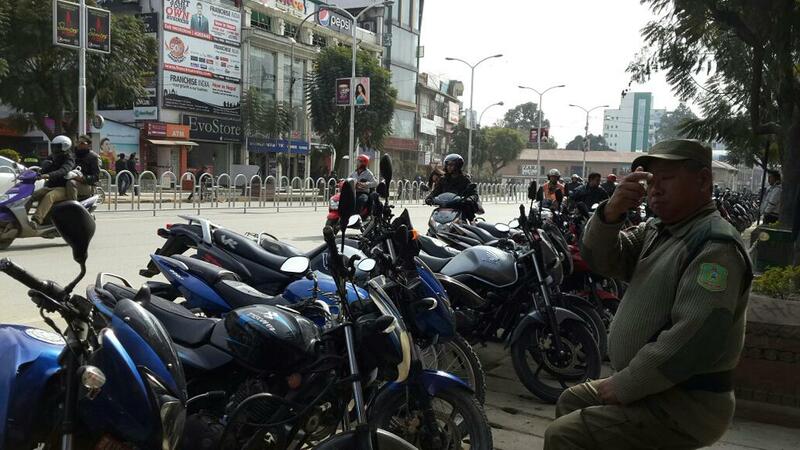 Welcome to the Kathmandu Metropolitan City (KMC) where on-street parking is free. 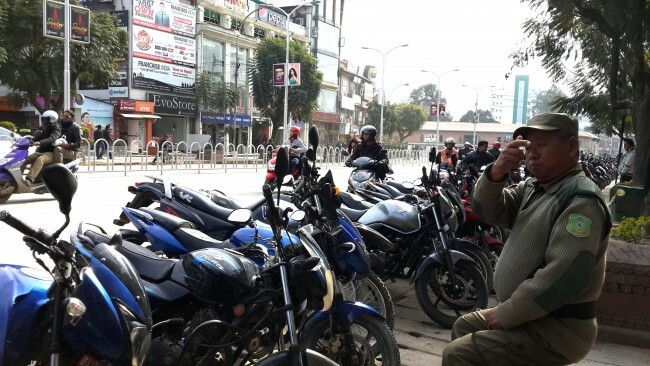 Parking lots in public spaces in Kathmandu used to charge around Rs 5 per hour for two wheelers and Rs 10 per hour for four wheelers. However, the Kathmandu Metropolitan City’s (KMC) revenue remained stagnant because the parking fees collected haphazardly at unregulated parking lots never reached the KMC, says Dhruva Kafle, chief of the revenue department at KMC. Between the fiscal year 2065/66 [2008/09] and 2069/70 [2012/13] its revenue from parking hovered between Rs 1.5 million and Rs 4.6 million. (However the fines from parking violations surpassed the revenue collected from parking fees, amounting to Rs 2-10 million annually during the same period.) At this rate, in 2069/70, KMC received less than Rs 12,600 per day from the allocated parking lots which was disproportionately low, given the number of vehicles registered in Kathmandu. In December 2013, the Kathmandu Metropolitan City office initiated free parking in the city’s allocated parking spaces after its contracts with private firms ended. The solution sought by KMC was supposed to be a temporary measure which has now been in practice for more than a year. This was a result of the confrontation and subsequent legal battle between the KMC and parking lot contractors. The roadside free parking area at Durbar Marg, Kathmandu. KMC identified 73 parking spaces in Kathmandu and solicited new tender bids on 18 February 2013 (2069/11/7). This time KMC had increased the minimum bid threshold. But some of the prospective bidders protesting the hike took the matter to the Supreme Court and the case remains sub judice. So amid the legal confusion, free parking continues at the 73 parking spaces. But even free comes with a cost. People complain that parking lots are unmanaged in the lack of parking attendants, parking slots are hard to find and parked vehicles are susceptible to damage like scratches and dents and in worst case, theft. As there is no one to keep track of parking duration, many people including locals and those operating businesses in the locality occupy the parking space throughout the day. “There is rarely any space in these allotted areas, so I often have to go through the hassle of driving around for another 15 minutes looking for a parking spot,” says Prakash Thapa, a driver. The only time he is able to park at Durbar Marg’s designated free parking area is during early mornings or late evenings, since the space is occupied all day by the vehicles of the people working around that area. “So I have to park my vehicle either at the hotel parking space, private parking lots or secluded alleys across the main street,” adds Thapa. A report entitled short-term criteria on free-of-cost parking prepared by KMC says large number of “unofficial” parking areas have been operated by local clubs and groups. Furthermore the document also states that the revenue collected from such parking areas fail to reach the state treasury and is instead used to protect ringleaders, weaken the administration, and develop a parallel ill-governed mechanism which adversely impacts security and good governance. According to this document, vehicles can be parked in the designated 73 areas from 6 am to 9 pm. It also states that vehicle owners shall be fined Rs 1,000 if they are found parking outside the designated lane. “This makes it difficult for us to charge parking fee since some road sections fall under the Department of Roads, so we need to have a clear parking policy that takes into account these broader management issues,” says Kafle. However Bhusan Tuladhar of UN-Habitat in Kathmandu says that such coordination issue between government bodies could be easily addressed. “If the municipality is able to work with the Department of Roads or any other concerned departments by getting all the required permits then parking management could be a lot more efficient,” says Tuladhar. Officials like Kafle admit that the parking mismanagement in Kathmandu is also the result of the KMC not being able to implement the rules it has formulated. “Lack of resources and manpower led to the mismanagement of the existing parking lots in the last decade which is why we are now working to prepare a comprehensive parking policy,” he says. While KMC officials are entangled in legal battle to enforce stricter regulations for parking, local experts say that unclear government provisions are also at the heart of this problem. Bhusan Tuladhar of UN-Habitat stresses that the government needs to take into account larger issues of urban mobility, the types of transportation in use, who do you allocate the roads to, and what kind of transportation can people in Kathmandu afford etc while formulating parking policies. “Parking is a means to promote public transportation,” says Tuladhar. When the contractors managed the parking lots, there used to be at least one parking attendant at each parking lot. But now with the parking spaces made free, vehicle owners have no option but to compromise with the security of their vehicles. Furthermore traffic police feel the free parking initiative has only added to their workload, since they are required to be more vigilant and also attend to people struggling to get their vehicles out of the messy parking spaces. Traffic police inspector Sitaram Hachhethu says, “The traffic police now have an added burden of managing the chaos on the road caused by free parking since there is increased commotion on the road with people struggling to get their vehicles out without help from anyone else.” He complains that the municipal police isn’t as active in managing parking as it was in the initial days leaving the traffic police with their plates full at all times.